After a late fumble sealed the Jaguars' fifth straight loss, 29-26 at Indianapolis on Sunday, the Jaguars (3-6) find themselves sitting alone in the AFC South basement with their playoff hopes fading fast and the search for answers becoming increasingly more urgent. He may not have many more chances this season to get the league’s attention. After a late fumble sealed the Jaguars‘ fifth straight loss, 29-26 at Indianapolis on Sunday, the Jaguars (3-6) find themselves sitting alone in the AFC South basement with their playoff hopes fading fast and the search for answers becoming increasingly more urgent. Ramsey didn’t stick around long following the game — and he didn’t say much. But it doesn’t require too much thought to understand why last year’s AFC runner-ups have made a mess of this season. What Luck did was expose the Jags’ mismatches by repeatedly going to his tight ends. Eric Ebron , Jack Doyle and Mo Alie-Cox combined for eight catches, 133 yards and three TD receptions — all in the first two quarters. And with Ramsey’s tag-teaming cornerback A.J. Bouye out because of an injured calf, Luck didn’t really have to throw at Ramsey much. Perhaps the most remarkable difference between this game and last year’s was that the Jags couldn’t put much pressure on Luck. After recording 14 sacks against the Colts last year, Luck didn’t go down a single time Sunday. He hasn’t been sacked in four games, the longest stretch of his pro career. One of those hits drew an unnecessary roughness call against Malik Jackson — after Jacksonville had called timeout. The penalty converted a third-and-3 into a first down, which helped the Colts score their final touchdown. There was plenty of blame to go around, though. Two plays after Jackson’s 15-yard penalty, linebacker Myles Jack was called for unnecessary roughness. And when the Jags jumped offside on the ensuing extra point, Marlon Mack made the decision to go for 2 a wise choice by plunging in from 1 yard out to make it 29-13. Ebron scored on a 53-yard pass seven plays into the game and again on a 12-yard TD in the second quarter. In between those two, he scored on a 2-yard run. While the defense improved in the second half, the mistakes continued. Josh Lambo, who had an extra point blocked in the first half, missed a 52-yard field goal wide left before making a 55-yarder with 4:03 left to get the Jags within 29-26. 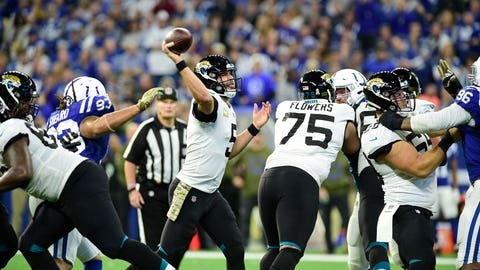 After a defensive stop, Blake Bortles quickly got Jacksonville into field goal range and appeared to have them in perfect position when the officials ruled Rashad Green Sr. went down at the Colts’ 23-yard line before the ball squirted free. But just before the next snap, the replay official stopped the play, overturned the call and assured Jacksonville of another inexplicable loss. Ramsey said the Jaguars were playing with a sense of desperation.